A rehearsal is no place for long-winded lectures. Keep comments concise. If you can “say it” in a non-verbal way, do it. Compliments and complaints can be made with the twist of the eyebrow or the wink of the eye without having to stop the rehearsal. The amount of learning that occurs during rehearsals is directly related to the degree of preparation and organization of the director and, to a lesser degree, the students themselves. 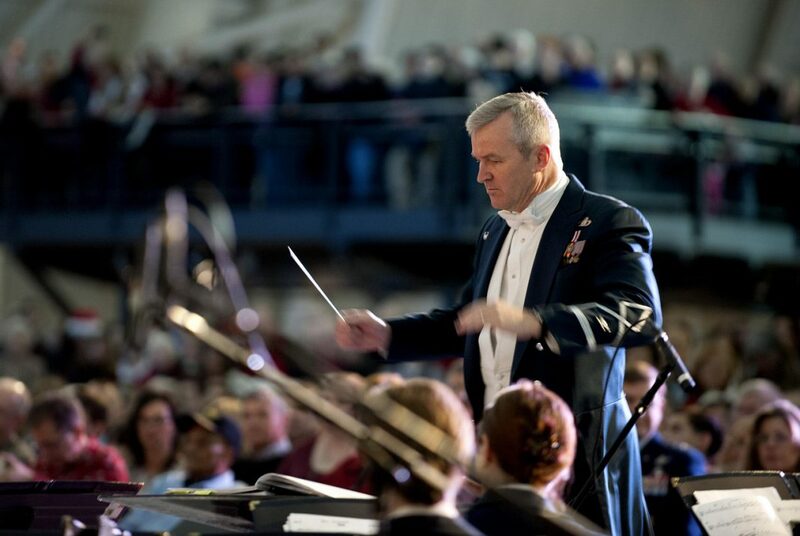 Keep all instrumentalists involved in the rehearsal through intelligent planning. When you must rehearse only a small group of players, keep others involved with questions that focus their attention on what is happening musically. Always give yourself at least ten minutes before a rehearsal to set the mind and develop the necessary energy level. Never arrive late for a rehearsal. One of a director’s greatest joys is greeting each of his musicians as they arrive. Always give yourself at least ten minutes after a rehearsal to quietly evaluate the rehearsal as you begin planning for the next. Most rehearsals should begin with some type of warmup. The amount and type of warmup needed is directly related to the ability and maturity of the ensemble members. You don’t have time not to warm up. Warmups usually include work with sound quality, blend, balance, intonation, scales, and ideas related to the music to be rehearsed. Warmups should be creative. Don’t allow them to become totally predictable. Remember: Warmups are music. Tuning is best improved as a group effort, most often by playing unisons and chords. Students constantly must be encouraged to experiment with pitch adjustments as they try to eliminate “beats.” Although the tuner might work well for checking individual problems, don’t waste rehearsal time tuning every player’s concert B-flat. If you feel pressure building during a rehearsal, change the pace with a humorous comment, a stretching exercise, or by simply walking off the podium for a minute to allow some conversation. If the concentration level is low, it does little good to keep rehearsing. When presenting a composition for the first time, give a short background talk about the composer, historical period, style, etc. If the composition has no information on the front cover, do some research on your own. Periodically walk off the podium while the group continues to play. Besides giving the director a different perspective, it often encourages students to find a “group beat.” The more the ensemble members are forced to listen for the beat, the better the chance they will mentally subdivide the beat. Learn early which students play better with extra pressure and which need constant encouragement. Too many compliments often lead to lazy musicians; too few compliments can make some give up. Be a psychologist on the podium. Before beginning a rehearsal make sure that all eyes can be seen. When possible have a sectional with percussionists before the first rehearsal of a new composition. 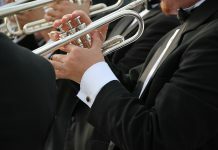 There are special problems associated with the use of many different instruments along with the problem of moving from one instrument to another during the same piece. At the very least, assign percussion parts ahead of time to minimize confusion. Don’t be afraid to give up a full rehearsal every once in a while for a sectional. If good section leaders are available, sectionals can often be as helpful as full rehearsals. 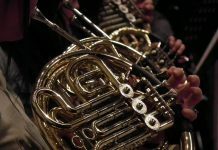 Encourage instrumentalists to portray the music visually, especially by not slamming instruments down at the end of a passage or the end a composition. Plan each rehearsal for maximum carry-over potential. It is not enough to simply teach students how to press valves and pull slides. They must remember concepts and styles and be able to transfer this learning to new compositions (e.g. all Sousa marches have some of the same stylistic problems). Practice what you preach. If you demand memorization of some material, long hours of practice, promptness, good manners, dedication, etc., then you must be ready to demonstrate these traits to the students. Players tend to mirror the attitude and personality of their director. They will most often do as you do, not as you say.